The Kestrel is intended as a logical step up from the popular Merlin but that little bigger and more âscaleâ in appearance. She is built from a combination of CNC and Die-Cut components that have been designed to make construction as simple and quick as possible. We know that many builders of this model will have very little or no experience so the construction has taken this very much into account. The characteristic T-Tail and cockpit area have been styled on many of the full-size, glass fibre gliders you see in the skies today. Just because this is a simple model, we felt she had to have real appeal as well. 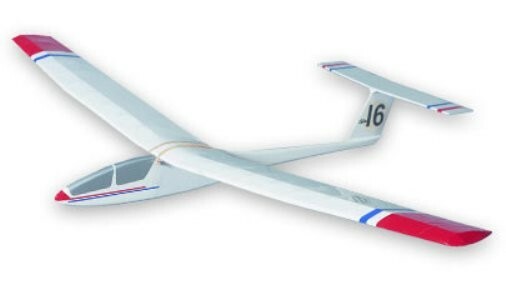 The wing section chosen is the more unusual RSG 29, which has excellent low drag combined with the high-lift flat bottom design so often favoured by model gliders. That flat bottom section helps a lot with the building but can be quite âdraggyâ if using a more normal âClark-Yâ. The fuselage and tail build up from sheet components and are a real joy to assemble. Whatâs more, you end up with a finished fuselage in double-quick time! Try the âKestrelâ, we know youâre going to enjoy her!.